Canadian educators and scientists have reviewed this unit. It is suitable for a wide range of elementary and secondary students; linked with the Common Framework of Science Learning Outcomes, K to 12 (Pan-Canadian Protocol for Collaboration on School Curriculum) plus geography and language arts learning outcomes. how to make maps as a tool to learn about and help birds. Activities in this unit culminate in a mapping activity. We may take our birds for granted, yet they have a lot to teach us. They are often our first introduction to the ways of the wild. Students practise observational skills by looking for basic features of bird species. Students erect a platform birdfeeder and observe which foods are preferred by which birds. Students do research, roleplaying, and interviewing to learn why birds live or range where they do. Students will become familiar with some common birdsongs and their meanings. Ornithology is the scientific study of birds. Ornithologists study every detail of birds’ lives, including how they find food or digest it, how they evolve, nesting habits, courtship rituals, and bird parasites. Is there an ornithologist in your community who could talk to your class about his or her profession? In this section, students will become budding ornithologists as they get to know more about birds and their fascinating lives. One of the things that ornithologists work to understand are the many survival challenges that birds face. This section of the kit will examine some of those needs and challenges. Students will research different areas of Canada and become familiar with some species of birds that these areas support. Students discuss various ways in which birds have adapted to winter, with emphasis on migration. Students will choose several migrators common to their area, then draw maps or murals tracing the migration routes. Lesson Plan: Are We Disturbing Birds? Students will identify changes that have taken place in their community in the recent past. Based on their findings, they will suggest how the changes may have affected local birds and how to improve conditions for them through specific habitat projects or changes in land use policies. Older students could develop a map-based plan of recommended action. Students investigate the importance of the Boreal forest region to wildlife, and birds in particular, and organize a display to make others aware of their findings. Students will conduct a survey to determine what habitat elements for birds are available or missing in their community. Results will be distributed to survey participants to help spread awareness about habitat conditions for local birds. We use “maps in our mind” all the time. That’s how we find our way from home to school. Printed maps help us find our way if we are lost. Maps can be simple drawings that explain how to find a friend’s house. They can be big, complex, or global (showing countries of the world). They can be conceptual and include information on the resources about birds in your community. Or they can be artistic and include artists’ renderings of birds in a local area. No single map includes everything— that’s why there are many kinds. We are probably most familiar with road-maps, which include roads, cities, and rivers and are drawn to scale. Others may depict subway systems, endangered species, or amounts of rainfall in an area. Maps can render anything! There are even maps that show the shape of the land beneath the ocean. A cartographer is someone who makes maps. Cartography is the science of making maps. There are endless ways to make maps that will help our feathered friends as well as help students learn about them. Students will complete a creative master map that is a mural, map, exhibit, and display all rolled into one! 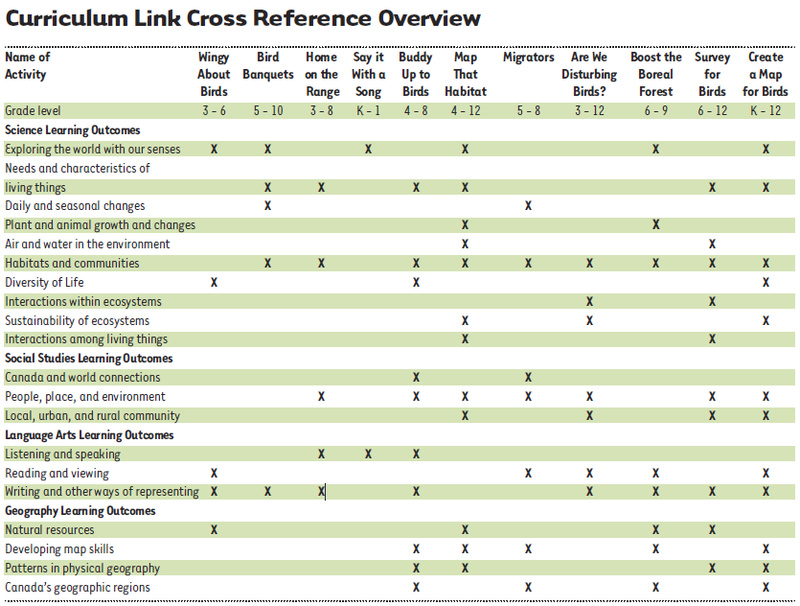 The master map will integrate what students learn about birds from activities in this kit. By doing the activities in this kit, or joining the Canadian Wildlife Federation’s latest habitat action program called Habitat 2020, you’re including your class among the many thousands of dedicated students who are giving Canada’s birds and the environment a fighting chance. Here’s a sampling of bird-related projects from schools.